William Pirkle Marshall, born July 22, 1930 in East Ridge Tennessee, is the son of John Ruble and Philona (Pirkle) Marshall. Their parents were Samuel West and Mary (Cartwright) Marshall and Phillip Sheridan and Iona (Griffith) Pirkle. All whose history can be found in The Heritage of Bradley County Tennessee 1836-1998. William P Marshall was married in East Ridge, May 23, 1951, to Margarette Readah Brannon. She was born Aug. 2, 1929 in Fyffe Alabama, the daughter of Homer Jackson and Laura (Marshall) Brannon, whose history can be found in Dekalb County Alabama. Bill and Margaret were married while he was in the US Air Force taking electronic training at Biloxi Mississippi. After completion of his training, they moved to Denver Colorado for Set School and Instructor Training. They spent the rest of the 4-year Air Force hitch with Bill teaching electronics and Margaret as a telephone operator. Their first son Rodney Kyle Marshall was born Oct. 23, 1952, at Fitzsimmons Hospital in Denver. Their second son, Donald Adair Marshall, was born Nov. 4, 1954 also at Fitzsimmons. After Bill’s discharge in Dec. 1954, they returned to East Ridge and Bill returned to Combustion Engineering where he was employed before entering the service. In view of Bills electronic instructing in the Air Force he was offered a Design Engineer Position in the Home Equipment Division. During this time He designed an electrical panel for the company’s heating & air system that was built by Penn Controls in Indiana. Penn offered him a job and the family moved to four states then back to Chattanooga and in their home. While growing with Penn they offered Bill a regional job that would be headquartered in St Louis. Bill showed how he could do the job better from Chattanooga and they said OK. Two years later they moved to Indiana. After a few years in corporate management he decided to go into his own business. 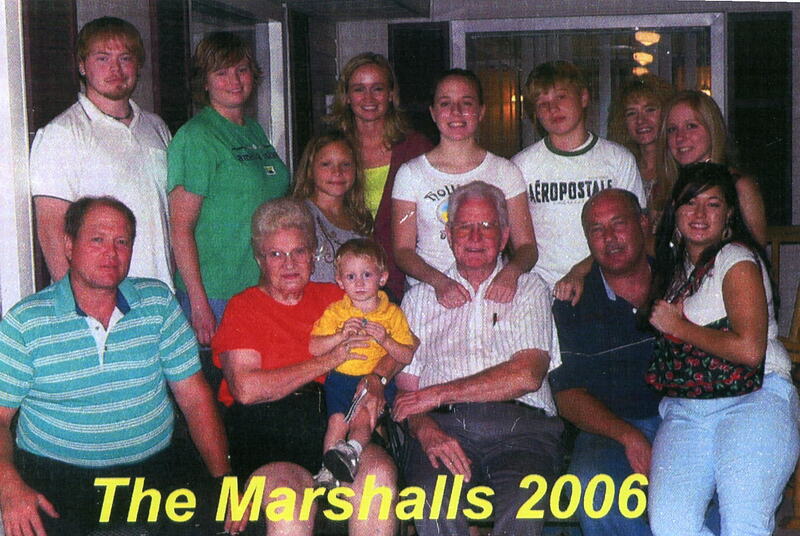 Investing their savings the Marshalls began manufacturing Recreational Vehicles in Nappanee, Indiana in a 4000-sq. ft bldg. After twenty odd years the company grew to 850,000-sq.ft., 1100 employees and ten plants. Bill had bladder cancer, which changed his focus. When a buyer for the company came along they sold and returned home. Old friends led them to Dade County and the old herb farm. After house boating, motor homing and horseback riding Bill started volunteering. He never ran for office because he did not want to be in politics. However, he led most non-political organizations over the next 20 years. Both boys went to school some in East Ridge and the balance in Indiana. After High School they both went to Tennessee Tech in Cookeville Tennessee. Kyle graduated in engineering and Don in marketing. They both came back to this area after the family business sold. Kyle has 2 girls and 1 boy. Sabra (born 23 Mar 1979), Deborah (born 13 Dec 1980), and Eric (born 6 Mar 1986) Deborah has the only great grandson, Trace (born 30 Jun 2004). Don has 4 girls and 1 boy. Rachael (born 26 July 1984), twins Natalie & Michelle (born 14 April 1991), William Paul (born 23 Aug. 1993), and Melissa (born 21 Jan 1995).